In zodiac-signs/”>Zodiac Signs Part 1 the primary qualities and the modes were described, and their combination was used to show the unique interpretations for each sign. Please read Zodiac Signs Part 1 before continuing as it forms the basis of what follows here. The third important contributor to the meaning of the zodiac signs the planetary rulers. 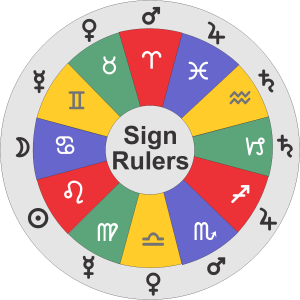 Each zodiac sign is ruled by a specific planet. 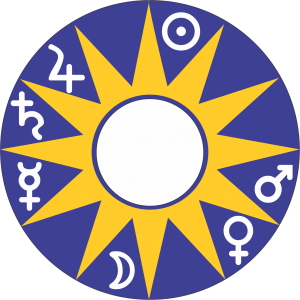 There is an ancient system of rulerships which, when followed, provides accurate answers to questions in horary astrology and in-depth interpretations in natal astrology. This system of planetary rulerships has an internal logic which dovetails with a number of basic astrological. It is important for the beginning astrologer to have a thorough understanding of these principles before considering other astrological studies. Together the 2 lights and the 5 visible planets rule the 12 zodiac signs. The 2 lights rule one sign each, and the 5 visible planets rule 2 signs each. The light can be understood as a pair with the Sun ruling the day and the Moon ruling the night. Each of the 5 visible planets rules one diurnal (day) sign and one nocturnal (night) sign. These day/night rulers by each planet form an integral part of the planetary rulership scheme. Mercury rules the signs either side of the lights: Gemini the diurnal sign and Virgo the nocturnal sign. Venus rules the next 2 signs either side of the lights: Libra the diurnal sign and Taurus the nocturnal sign. Mars rules the next 2 signs either sign of the light: Aries the diurnal sign and Scorpio the nocturnal sign. Jupiter rules the next 2 signs either side of the lights: Sagittarius the diurnal sign and Pisces the nocturnal sign. Finally Saturn, the planet of darkness, rules the signs opposing the lights: Aquarius the diurnal sign and Capricorn the nocturnal sign. Saturn represents darkness and the Sun represent light. Saturn represents things that are hard and the Moon represents things that are soft. 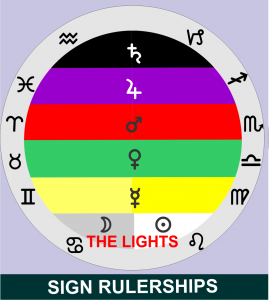 Notice the pairs of opposing rulers: Mercury rules the signs opposite those ruled by Jupiter; Venus rules the signs opposite those ruled by Mars, and Saturn rules the signs opposite those ruled by the lights. These pairs are natural planetary opposites: Mercury is the ruler of small things and details, and Jupiter rules big things and the broader perspective. Venus is the planet of pleasure, pleasantness and fun; and of bringing people together in love and diplomacy; and Mars is the planet of divisiveness, the natural ruler of strife, warfare and divorce. The lights represent everything that is ‘in the light’, with the Sun representing truth and clarity; and Saturn has sometimes been called ‘the prince of darkness’ and ‘the father of all lies’. The Sun represents light and life while Saturn represents death and desolation. The Sun is the most physical representation of divinity and the only cosmic body with no shadow. Compare this with the Moon whose various phases are shown by varying degrees of shade. She drinks of his light until she is drunk with his love; and then empties out until at the darkness of the new Moon, when she again yearns for his love. The Sun and Moon form a natural pair, archetypes of father and mother, male and female; and the Moon‘s phases represent the stages of their relationship. The system of planetary rulerships the structured from a system of interlocking principles that is both intricate and beautiful in its construction. Day and Night: Each of the 5 visible planets rules one day sign and one night sign, and the 2 lights represents day and night.